I had to make homemade chicken and dumplings. Because as if overnight (and I’m keen to think that’s how it happened) it would seem as if the season has changed. Just last week I was roasting in the summer sun as I picked the ripe tomatoes from the vine, only to find myself bundled in a down jacket before heading out to do our morning milking this past week. I have time now in the mornings for a cup of espresso, with a dash of fresh milk, before heading out to do the morning milking with Cecelia. It’s either take the time to wake up, drink a hot cup of coffee, and head out a bit later or milk in the dark. I’d much prefer the former. I don’t mind the change of the temperature, and truth be told, the break from the heat is welcomed. This time of the year is pure magic in the Pacific Northwest and I’m ready to soak up the very best it has to offer. 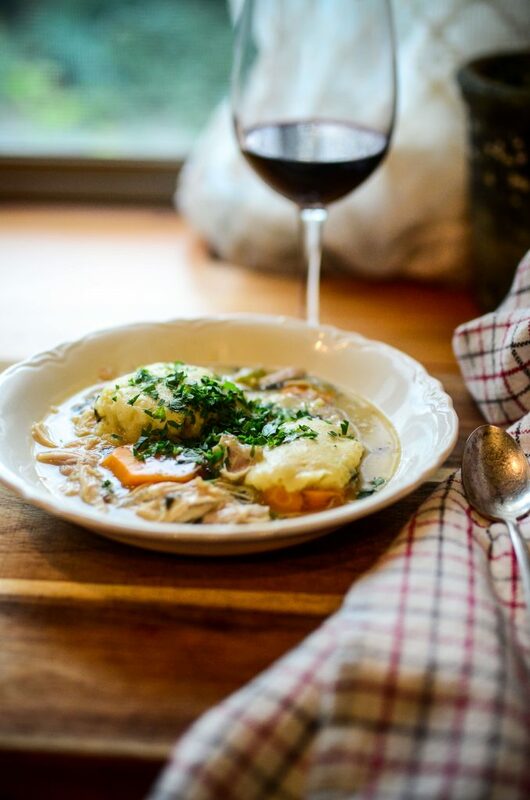 Homemade chicken and dumplings, certainly, are included in that very best. Also included in that very best: ripe pears gleaned from a nearby organic orchard, fresh radishes and turnips from the garden, the honey harvest, and more apple butter than I can possibly devour. It takes time, but it’s worth it. If you want to skip the time-consuming bit, just start with a rotisserie chicken and canned chicken stock. It won’t be as good, but it’ll still be wonderful. 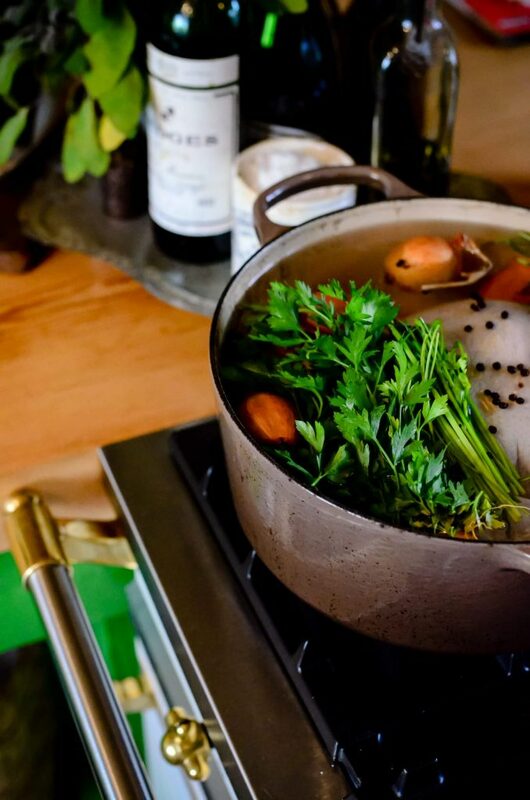 Combine the chicken, water, vinegar, peppercorns, and vegetable bits together in a large pot or dutch oven. Bring to a simmer, cover, and allow to very gently simmer for 8-12 hours. Remove the chicken from the stock and let it cool. Strain the stock to remove any stray bits of bone, skin, or vegetables. 1. Melt the butter in a large pot. Add in the carrot, celery, onion, and a pinch of salt – sauté until soft and tender, about 10 minutes. 2. Add in the cognac and flour and whisk to combine, taking care to scrap up any browned bits from the pan and to break up any small bits of flour. 3. Add in the chicken, chicken stock, thyme, a generous pinch of sea salt, and freshly ground pepper. Bring to a simmer, cover, reduce the heat to low, and allow the ingredients to mingle for 20-30 minutes. Season to taste with salt and upper. 4. Right before you’re ready to serve, prepare the dumplings. How? How do I prepare dumplings? Don’t worry. I’m about to tell you. 1. Whisk the flour, milk, butter, salt, and baking powder together in a bowl with a fork until combined, smooth, and fluffy. 2. Drop the dumpling dough by the spoonful into the hot, simmering chicken stew. You should be able to fit about 12-15 dumplings into the pot. Cover the pot and allow the dumplings to cook thoroughly, about 15 more minutes. 3. Garnish with fresh parsley, because it looks beautiful. And that matters. Is there anything you’d rather tuck into? Poached pears. Red wine. Stuart’s cozy socks that he gets super irritated when I steal. It doesn’t get any better. In other news, is anyone else finding themselves tired at 7:30 pm? That’s what time it’s been getting dark here already and I’ve found myself slipping into the slumber a wee bit earlier than is socially acceptable. I’m sorry world, what was that? You need me to function and take care of my children past 7:45 pm? I’m not allowed to slip into a bubble bath and state of Netflix nirvana until at least 8:03 pm? Fu-get-about-it. It’s fall now. I do what I want. And part of what I want to do is make homemade chicken and dumplings, wear my flannel shirts I’ve been missing all summer long, and go to bed at 7:50 pm. Homemade chicken and dumplings, my friends. Get you some. oh my gosh – yum! i will be adding this to my recipes to try! I can’t think of a single time in my life that I’ve had chicken and dumplings, yet now I have a sudden, nostalgic craving for them. Welp. This looks absolutely amazing. I will be trying this on some cold fall day. Thanks! Just wanted to let you know that this was incredibly delicious — definitely the best chicken and dumplings recipe I’ve ever tried! I ended up subbing desert wine since I didn’t have cognac. I’m really glad, in retrospect, that I didn’t leave out that ingredient. It really added depth of flavor to the dish! We’re back up to 90+ degree weather this week in northern California, but the soup was great on the 70 degree days we had last week! It is the time for slow warming chicken soup and dumplings…now that out heat wave I think has finally ended (95 all week for late September!). Can’t wait to get this on my stove top! Thank Shay for the timely recipe share! This tasted awesome! You’re recipes are SOOOO GOOOOD! I virtually never post recipes on facebook, but this one made it. Definitely for the delicious sounding recipe itself, but most importantly for the hilarious commentary, which is classic Shaye Elliot! This looks lovely! I definitely think it’s worth doing the 12-hour stock step. Also, I’ve been looking forward to making these dumplings, https://www.culturedfoodlife.com/recipe/sourdough-dumplings/, for a long while, so I think I will do both things at once! I like to pinch my husband’s t-shirts, especially now I’m expecting. But he doesn’t get mad. Life is good. Agreed!! I impatiently await fall and the return of my beloved flannel shirt every year. Big pots of fresh soups, posole, enchiladas and all things baked, now that is cool enough to have the oven on. Thank you for the recipe. Beautifully written description of all things to love about fall! This recipe just made the top item on my “To Do” list this weekend. Yummmm! Hello! I have been meaning to ask you for a long time, do you have any “convenience foods” you allow in your pantry? We try to eat only whole foods and as much from scratch as possible, but there are days when I JUST CAN’T. The days when I am in my first trimester and have three girls under five and my husband won’t even be home for dinner and I feel like I am wearing cement shoes and I am paralyzed by the idea of making three whole food meals per day. What do YOU make on those days? Do you even have cans of chili or soup for those days or do you have a different coping strategy? Think this can still work with just simmering for 4 hours? I mis-read the directions and didn’t realize that I should have started this 4+ hours ago, dang it. All the ingredients are prepped and this is my only day to have an afternoon to make it! I loved the recipe! Making it for a second time today! I made it the first time without congnac and it was very good, but I had my husband get a bottle for me and I excited to try it again with the added layer of flavor. This looks really good. I don’t have cognac readily available. Is there a good substitute? ie, would whiskey work?